JP 2015-10-08 ¥1,050 ×2 ? US 2015-10-09 $9.49 ×2 ? UK 2015-10-09 £7.99 ×2 ? EU 2015-10-09 €9.99 ×2 ? JP 2015-10-09 ¥1,050 ×2 ? EU 2015-10-09 €8.99 ×2 ? 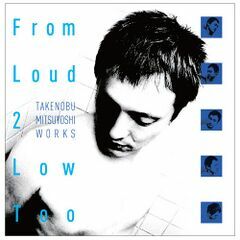 From Loud 2 Low Too: Takenobu Mitsuyoshi Works is the second album by Takenobu Mitsuyoshi. Like his first, From Loud 2 Low: Takenobu Mitsuyoshi Works, it primarily features songs he composed for a variety of Sega games, plus some new, exclusive tracks. The album was made available as a download on Amazon and iTunes in 2015, with a number of tracks missing. Each disc is presented as a separate album titled "Vol. 1" and "Vol. 2". Individual tracks cost ¥150, US$0.99, £0.79 (£0.99 on Amazon) or €0.99 (€1.29 on Amazon).